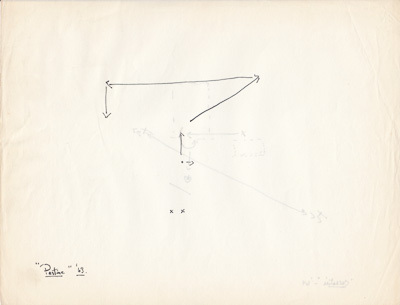 Pastime was Childs’ first solo and was performed on the program “A Concert of Dance #4” in January 1963 at Judson Memorial Church in New York City. Pastime is performed to music by Philip Corner, and Childs has revived the solo on several occasions. Pastime in performance, Friday October 4, 2013, at FringeArts, Philadelphia. Dancer: Gabrielle Revlock. Pastime takes place in three different spatial locations so that the simple in-place theme with the flexed foot can be presented in three difference situations: vertical, enclosed (in tubular jersey), and upside down. 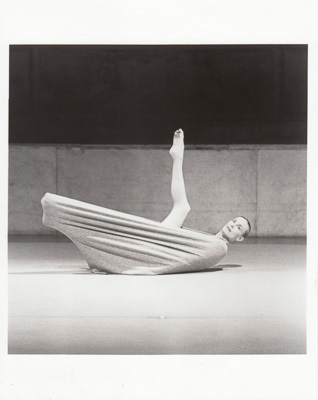 part of the program “Dance at Judson: A Concert with Lucinda Childs and David Gordon"
Performance history as of December 2014. Philip Corner, “On Tape from the Judson Years” (CD, Album) Alga Marghen, plana-C 4NMN.019, 1998. 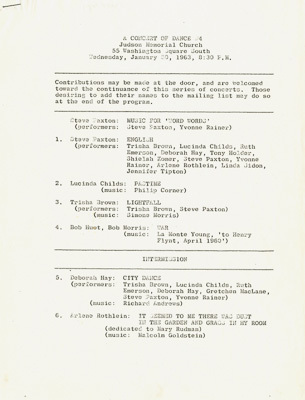 There is no video documentation of the first performances of Pastime.